I love chocolate. I love mint. Put them together and I am in heaven. This shake actually reminds me of something that I would have ordered at an ice cream store back when I was still eating dairy products. The beauty of this shake is that it doesn't have any ice cream in it at all(vegan or otherwise). It's 100% healthy but, it tastes so decadent you feel like you're indulging. My kind of shake! 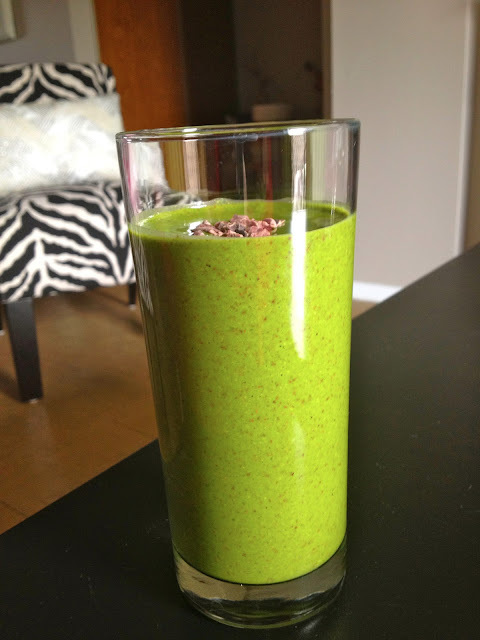 I made this shake around St. Patrick's day when my email was flooded with variations on the "Shamrock Shake". I've never had a Shamrock Shake from McD's but it sounds like something I totally would have ordered. So I decided to make my own healthier version for breakfast. Let's just say it was love at first sip... or slurp actually since I ended up eating it with a spoon! Since then, I've had one of these at least once a week. I love it so much! Before I share the recipe, let me just say that this does not necessarily have to be a healthy shake. You could definitely swap out the almond milk for some yummy coconut milk ice cream. And I will definitely do that in the summer time as a treat. But, for now, I like having it as an occasional breakfast choice that happens to be healthy but tastes like I'm being naughty! 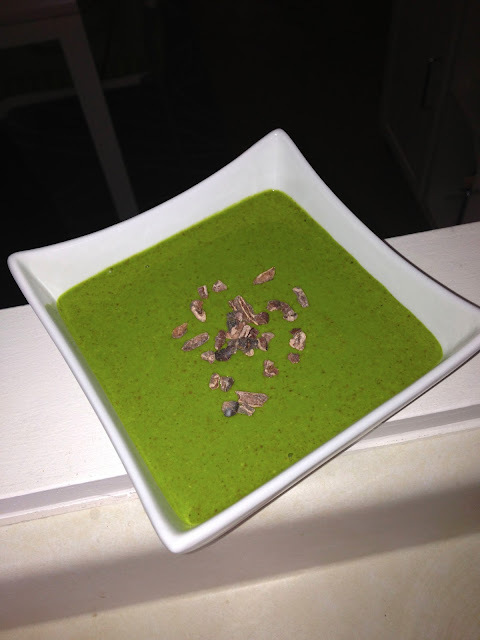 Begin by adding the oats, spinach and almond milk to the blender and process until smooth. Next add your frozen banana chunks and, while the blender is still on, drop in the peppermint extract and cacao nibs. Process for a few more seconds and then serve. Enjoy with a straw or a spoon! The spinach gives this shake it's green color and also an added health boost. If you're not a fan of adding spinach to your smoothie then you could add a bit of Spirulina powder to get the green color. I don't recommend adding green food coloring to this because I think it's weird and takes away from the goodness of this shake. But that's just me. If you're down with that, then by all means, add away! I like adding oats to my shakes and smoothies once in a while to make them a bit creamier. Plus, there's the added benefit of a little extra fiber and protein. If you don't have cacao nibs then you could definitely sub in some cacao powder Although, the color won't be the same, it will still taste great. You could even try adding in some dairy-free chocolate chips instead of the cacao powder. By the way, I talk about some of the health benefits of raw cacao in this post. I looooved "Fat, Sick and Nearly Dead". My husband and I were inspired to make some really major changes in our diets based on that movie. We watched it on Netflix, though, so if your readers have Netflix, check there for it too! WIAW # 27 and Wacky Weather!